Corresponding authors. E-mail addresses: gbdeng@hunnu.edu.cn (G. Deng), yliang@hunnu.edu.cn(Y. Liang). Abstract: In this work, an efficient copper-catalyzed three-component reaction for the synthesis of sulfenylimidazo[1, 2-a]pyridines using elemental sulfur as the sulfenylating agents has been developed. The reaction could proceed smoothly with a high degree of functional group tolerance and provide the desired products in moderate to good yield. The imidazo[1, 2-a]pyridine core is of great interest on account of their broad applications in many bioactive natural products and pharmaceuticals , such as alpidem , zolpidem , necopidem , saripidem , zolimidine , minodronic acid  and olprinone . Furthermore, sulfur-containing substances play a particularly significant role in a variety of synthetic drugs and natural products, and represent a ubiquitous "privileged scaffold" . Therefore, there has been increased interest in the exploration of synthetic methods for the formation of sulfenylimidazo[1, 2-a] pyridines in recent years. To the best of our knowledge, lots of methods have been reported to prepare aryl sulfides by various organic sulfenylating agents such as disuldes , thiols , sodium sulfinates , sulfonyl chlorides , sulfonyl hydrazide  and sulfinic acids  (Scheme 1b). However, most of these organic sulfenylating agents are foul-smelling, toxic, unstable, or expensive, which limited their widespread application. In order to comply with environmental friendly chemistry principles, more and more scientists focus much attention on inorganic sulfur as a source of C－S bond formation. For example, Adimurthy group  and Deng group  all reported the three-component one-pot synthesis of sulfenylimidazo[1, 2-a]pyridines using haloarenes and elemental sulfur with a copper catalyst (Scheme 1b). Compared with organic sulfenylating agents, use of haloarenes and elemental sulfur  as a thioarylation source is of significant interest in organic synthesis. However, some unfavourable halides as byproducts will be produced during the reaction, which is harmful to our environment. Therefore, choosing an environmentally friendly sulfenylating agent is still highly desirable. Arylboronic acids as arylation reagents are used in organic synthesis due to low toxicity, high stability (against air, moisture and temperature) and good chemical reactivity. Very recently, Jiang and co-workers  described a palladium-catalyzed C－H bond oxidative sulfenylation of imidazo[1, 2-a]pyridines with arylboronic acids and elemental sulfur in ionic liquids (Scheme 1c). However, the complex and expenxive catalytic system (Pd(OAc)2/CuI/1, 10-Phen/ Ag2CO3/Cs2CO3) should be limited in the practical production process. Consequently, simple and cheaper strategy to construct sulfeny- limidazo[1, 2-a]pyridines is still highly appealing. In continuation of our endeavors devoted to the development of the synthetic strategies of sulfur-containing substances , we report herein the sulfenylation of imidazo[1, 2-a]pyridines through a one-pot three-component system using catalytic amount of copper catalyst and ligand, and oxygen as a green oxidant. (Scheme 1d). We began our investigation on the model reaction of 2-phenylimidazo[1, 2-a]pyridine (1a), phenylboronic acid (2a), and elemental sulfur (S8) to optimize the reaction conditions (Table 1). 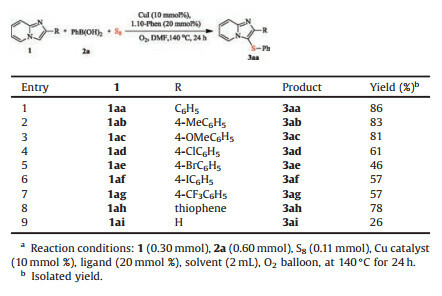 The expected product 2-phenyl-3-(phenylthio)imidazo [1, 2-a]pyridine (3aa) was obtained in 52% yield by employing CuI (10 mmol%) as catalyst, and 1, 10-Phen (20 mmol%) as ligand in DMF at 140 ℃ for 24 h (entry 1). To our delight, the expected product yield increased to 86% when the reaction was performed with O2 balloon (entry 3), and resulted in rather poor yield with N2 balloon (entry 2). Then, we focused our efforts on searching for an efficient copper catalysts (including CuI, CuCl, CuBr, CuCl2, CuBr2, Cu(OAc)2, and CuF), and the results revealed that CuI as the best catalyst (entries 3-9). Further, no improvements were observed when the reactions were carried out in other ligands (including substituted 1, 10-Phen, DMEDA, TEMED, L-proline and bipy) (entries 10–16). We then investigated various solvent effects on this transformation, and DMF was found to be the optimal solvent (entries 17 and 18). 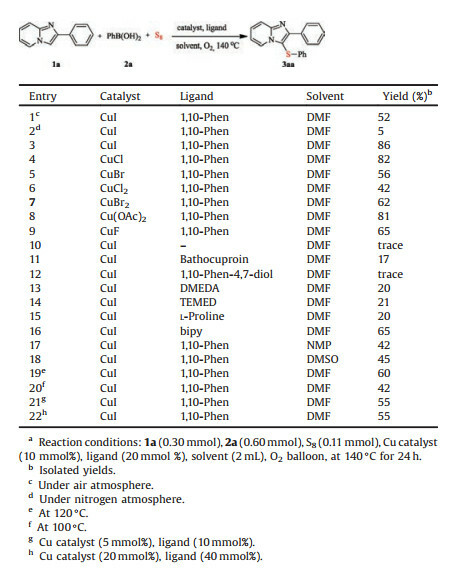 It is noteworthy that the yield decreased when changed the reaction temperature and the amount of CuI and 1, 10-Phen (entries 19–22). Thus, the optimized reaction conditions were as follows: 1a (0.30 mmol), 2a (0.60 mmol), S8 (0.11 mmol), CuI (10 mmol%), 1, 10- Phen (20 mmol%), in DMF (2 mL) under O2 balloon at 140 ℃ for 24 h.
With the optimal reaction conditions in hand, the scope of the benzene rings of 2-arylimidazo[1, 2-a]pyridines was investigated. 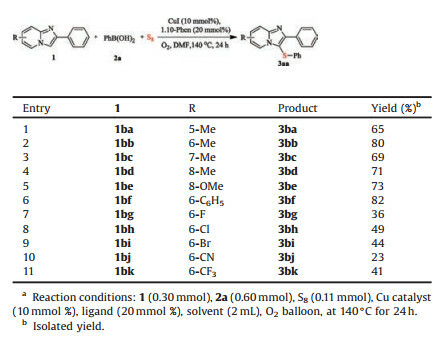 As can be seen from Table 2, the optimal reaction conditions were applicable to various groups on the benzene rings of 2-arylimidazo [1, 2-a]pyridines, providing the corresponding sulfenylated products (3aa–3ag) in moderate to good yield. When the 2-arylimidazo [1, 2-a]pyridines bearing a variety of electron-donating groups, such as methyl and methoxy, the highly reactive coupling partner provided corresponding products (3ab) and (3ac) in 83% and 81%, respectively. Gratifyingly, various electron-withdrawing groups, such as chloro, bromo, iodine, and trifluoromethyl groups, were compatible with the reaction conditions and afforded desired products (3ad–3ag) in moderate yield. The result represented a significant electronic effect of 2-arylimidazo[1, 2-a]pyridines. It was worth noting that the thiophene-substituted imidazo[1, 2-a] pyridines could also be easily converted into desired product (3ah) in 78% yield and imidazo[1, 2-a]pyridines was also transformed to desired product (3ai) in 26% yield. 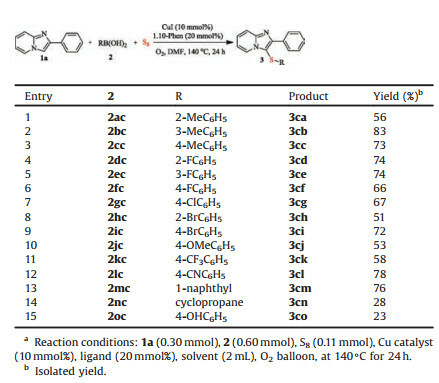 Subsequently, we investigated the substrate scope on the pyridine moiety of 2-arylimidazo[1, 2-a]pyridines (Table 3). It was found that the position of substituents did not obviously effect on the reaction. The substrates with methyl group at C-5 (1ba), C-6 (1bb), C-7 (1bc) and C-8 (1bd) gave the desired products (3ba–3bd) in good yield. Similarly, other substrates (8-OMe, 6-Ph) can be easily converted to the desired product (3be) and (3bf) in 73% and 82%, respectively. Moderate yields (3bg–3bk) were achieved when the electron-withdrawing groups at C-6 of 2-arylimidazo[1, 2-a]pyridines. The results indicated that an electronic effect on the substituted group played a significant role in the reaction. To further examine the scope and limitations of the reaction, we next set out to test various arylboronic acid derivatives for this kind of reaction. As can be seen from Table 4, the o-, m- or p-methylphenylboronic acids and halogen-phenylboronic acids all could efficiently react with 2- arylimidazo[1, 2-a]pyridine and elemental sulfur to afforded corresponding products (3ca–3ci) in moderate to good yield. Importantly, p-cyano-phenylboronic acid and 1- naphthylboronic acid could performed with 2-phenylimidazo [1, 2-a]pyridine, elemental sulfur and produced the desired product in 78% and 76% yield, respectively. We were pleased to find that the method could be extended to aliphatic boric acid, such as cyclopropaneboronic acid, to afford the corresponding sulfenylated product (3cn) in 28% yields. Interestingly, p-hydroxy phenylboronic acid could also convert to the desired product (3co) in 23% yields. To investigate the mechanism of this type of reaction, several control experiments were performed, as shown in Scheme 2. Under the standard conditions, when phenylboronic acid was employed to react with elemental sulfur for 24 h, the complicated mixtures A was obtained (see the Supporting information for details), and the desired product 3aa was obtained in 56% yield after addition of 1a for 12 h. The result suggested that either diphenyl disulfide or diphenyl sulfide was a possible intermediate in this process. Subsequently, 1a was allowed respectively to react with diphenyl disulfide and diphenyl sulfide for 12 h under the standard conditions. To our delight, diphenyl disulfide could give 98% yield of 3aa. However, diphenyl sulfide could not give the corresponding product. These results indicated that the threecomponent reaction underwent the process of diphenyl disulfide as intermediate. Based on the present experimental results and the previous reported mechanism , a proposed catalytic cycle for the formation of sulfenylimidazo[1, 2-a]pyridines is given in Scheme 3. Initially, arylboronic acid and elemental sulfur could converted to diphenyl disulfide in the presence of CuI, 1-10-Phen, and O2 catalytic system. Then CuI reacts with diphenyl disulfide to form electrophilic species PhS+ C. Subsequently, the regioselectively electrophilic attack of PhS+ C on imidazole ring to form imidazolium intermediate D, which can undergo proton elimination to afford the desired product 3aa, with the concomitant formation of copper catalyst. 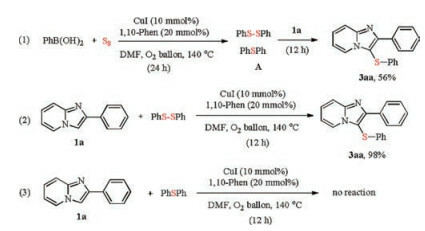 At the same time, the PhSH could reproduce diphenyl disulfide by O2 to complete the catalytic cycle. 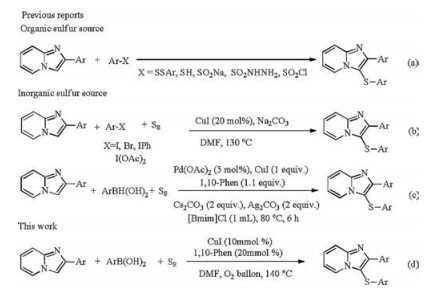 In summary, we have developed a simple and efficient method for synthesis of sulfenylimidazo[1, 2-a]pyridines by coppercatalyzed one-pot three-component system with arylboronic acids and elemental sulfur. Further more, The method has a broad substrate scope, with a variety of substituent groups on aryl boronicacids as well as 2-arylimidazo[1, 2-a]pyridines. In addition, efforts to extend the applications of the transformation in organic synthesis as well as screen for biological activity of these types of compounds are now in progress in our laboratory (General experimental procedures and spectral data of product are provided in Supporting information). This work was supported by the National Natural Science Foundation of China (Nos. 21072054, 21572051, 21602057), the Ministry of Education of China (No. 213027A), and the Scientific Research Fund of Hunan Provincial Education Department (No. 15A109). Supplementary data associated with this article can be found, in the online version, at https://doi.org/10.1016/j.cclet.2017.12.013. (g) Y. Abe, H. Kayakiri, S. Satoh, et al., J. Med. Chem. 41(1998) 4587-4598. (c) P. G. George, G. Rossey, M. Sevrin, et al., Monogr. Ser. 8(1993) 49-65. (b) S. M. Hanson, E. V. Morlock, K. A. Satyshur, C. Czajkowski, J. Med. Chem. 51(2008) 7243-7252. H. Depoortere, P. George, US 5064836, 1991. D.J. Sanger, Behav. Pharmacol. 6 (1995) 116-126. (b) L. Almirante, L. Polo, A. Mugnaini, et al., J. Med. Chem. 8(1965) 305-312. (c) Y. Uemura, S. Tanaka, S. Ida, T. J. Yuzuriha, J. Pharm. Pharmacol. 45(1993) 1077-1081. (f) C. M. Rayner, Contemp. Org. Synth. 2(1995) 409-440. (f) Z. Li, J. Hong, X. Zhou, Tetrahedron 67(2011) 3690-3697. (e) C. Ravi, D. Chandra Mohan, S. Adimurthy, Org. Lett. 16(2014) 2978-2981. 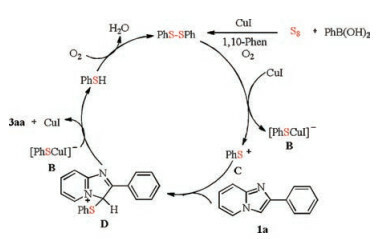 (b) X. Huang, S. Wang, B. Li, et al., RSC Adv. 5(2015) 22654-22657. (b) L. Yu, Y. L. Wu, T. Chen, Y. Pan, Q. Xu, Org. Lett. 15(2013) 144-147. (c) Z. Li, J. Hong, X. Zhou, Tetrahedron 67(2011) 3690-3697.